The Nicaraguan revolt to oust President Daniel Ortega from office began over two and a half months ago. University students initiated the “civic revolution,” called the April 19th Movement, but campesinos, civil society and several business organizations soon joined in, as well as feminist groups, the LGBQI community, and the indigenous and Afro-descendants peoples. Many of Nicaragua’s indigenous and Afro-descendant peoples live along the Caribbean coast. During the Sandinista revolution (1979-1990), some Miskitu and other indigenous and Afro-descendant coastal groups fought as counter-revolutionaries in the US-backed Contra War. The Sandinista state in 1987, then headed by FSLN President Daniel Ortega, passed the Autonomy Law which established two politically autonomous regions—the North and South Caribbean Autonomous Regions. The Communal Property Law passed in 2003, under the Liberal Party President Enrique Bolanos, and territories in the autonomous regions began receiving land titles. Since the FSLN returned to power in 2007, Ortega’s government has acted to dismantle regional autonomy on the coast. Most blatantly, the state has allowed mestizo land settlers from the Pacific, outside industries, and mega-projects to invade and exploit indigenous and Afro-descendant rainforest territories. The FSLN also has introduced parallel territorial governments, stacked with Sandinista beneficiaries; and reportedly stolen elections. Due to these injustices, many indigenous and Afro-descendant peoples on the Caribbean coast today want to put an end to the Ortega-Murillo regime. In early April 2018, a forest-fire raged in the Indio Maiz Reserve, set off by an illegal land-settler. The South Caribbean Autonomous Region (RACS) residents joined an incipient and little-known student’s movement in Managua to protest the government’s poor handling of the near-by Indio Maíz forest fire. Just two weeks later, the students protested Social Security reform and opposition groups in RACS participated. Bluefields, the RACS capital, made international news on April 21st. Local reporter Angel Gahona was killed by a gun-shot wound to the head, while broadcasting the protests on Facebook Live. More marches followed in Bluefields to protest the killing of Gahona; and the two falsely accused Kriol youths (Brandon and Glen) arrested for his murder and now being held in the “La Modelo” jail in Tipitapa. RACS continues to participate in the April 19th Movement national marches. The Miskitu and other North Caribbean Autonomous Region (RACN) residents did not rise-up to protest cuts to Social Security in mid-April. They claimed Social Security was not their fight as they do not receive pensions as farmers, fisherman, and lobster-divers. In the RACN, only the regional political party Yatama made noise by announcing their support for the April 19th Movement. Yatama then quieted down for two months, while the state unleashed terror on the Pacific side of the country. Yatama’s two-month silence was surprising, given its status as a regional indigenous political party that challenged FSLN control on the Caribbean coast. Additionally, a cohort of Yatama members were former Contra warriors—historic enemies of the Sandinistas during Nicaragua’s war-torn years of the 1980s. Many coastal residents speculated that Yatama remained acquiescent because they were still recovering from their recent beatdown by the FSLN in the November 2017 elections. During post-electoral protests in November, pro-government paramilitaries burned Yatama headquarters and radio to the ground, and turbas (Sandinista Youth gangs) toppled a symbolic Indian warrior statue in the town center. FSLN operatives then threatened the lives of Yatama leaders. The Police backed the paramilitaries and the turbas and detained over 100 Yatama political prisoners in the Bilwi jail for two months. Yatama leader, Brooklyn Rivera (center left, in green shirt) joins solidarity march in Bilwi. Rivera was referring to the Pacific coast citizens’ documentation–videos posted on social media–that pro-government paramilitary forces perpetrated violence against Nicaraguan citizens. Technology had delivered a devastating blow to the many Sandinista-controlled news stations. For the first time, videos revealed the FSLN modus operandi–they lied to confuse the pueblo, played the victim, and blamed violence on the opposition. On the Caribbean coast, the FSLN successfully had used these tactics against Yatama for years. Brooklyn Rivera announced that Yatama would join the April 19th movements’ Paro Nacional (national shutdown) on Thursday, June 14th and planned a march in Bilwi. The same day as the march, an FSLN prayer session for peace was underway in Bilwi’s central park. Yatama protestors claimed that as they neared the park, Sandinista youth gangs, or turbas, began throwing stones at them. Conflict escalated and later, unidentified gangs looted restaurants owned by current and former Sandinista government officials and FSLN office buildings. By the day’s end, three Bilwi residents were killed by gun-shot wounds and many more, injured. Both sides—the Sandinistas and Yatama–blamed the other. In the early evening on June 14th, pro-government paramilitary forces backed by the Police, neared the Yatama house, intending to burn it down, once again. The paramilitaries backed down after seeing armed ex-fighters waiting in the patio. A local FSLN media campaign began criminalizing Yatama leaders, calling them murderers. Anonymous FSLN operatives threatened to kill Yatama leaders and burn down their homes. These acts of political terrorism were straight out of the dictator’s handbook. Yet, on the Caribbean coast, the FSLN was perpetrating violence and repression against indigenous and Afro-descendant peoples, whose rights are recognized internationally. 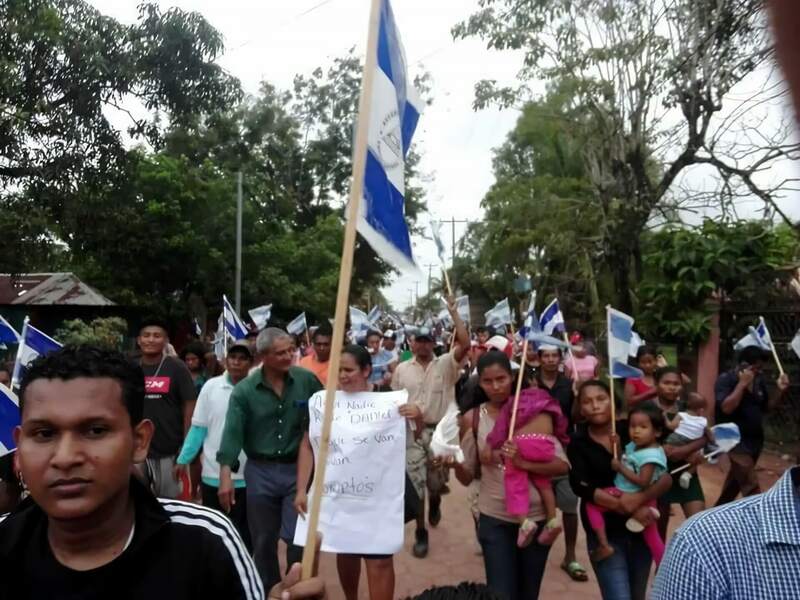 International indigenous rights and human rights groups representing the Caribbean coastal peoples, could mobilize to help the April 19 Movement bring down the Ortega-Murillo regime and re-democratize Nicaragua. The most recent Inter-American Commission on Human Rights (IACHR) report found that riot police and government armed paramilitary forces and turbas (Sandinista youth gangs) killed more than 200 citizens, injured more than 1,000, and disappeared hundreds. The Permanent Council of the Organization of American States (OAS) released their report on Friday, June 22, backing the findings of the IACHR, (Inter-American Commission on Human Rights) an independent and autonomous organ of the OAS. The IACHR concluded that the Nicaraguan State had committed grave human rights abuses against its citizens. Nicaragua denied the charges and the undeniable – the body count. Denying these charges was a form of Sandinista state repression and obvious psychological misleading of the population. This article was originally published in The Havana Times. It has been re-published at IC with permission.